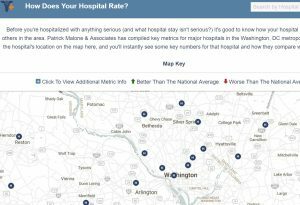 Patrick Malone & Associates has a new tool for patients to easily check out how their hospital stacks up on quality and safety measures. The tool is on our website here, and covers all hospitals in the Washington D.C. metropolitan area, including northern Virginia, the Maryland suburbs of DC and the District of Columbia itself. Timeliness of emergency room care. This gives the average wait time. Shorter is better. 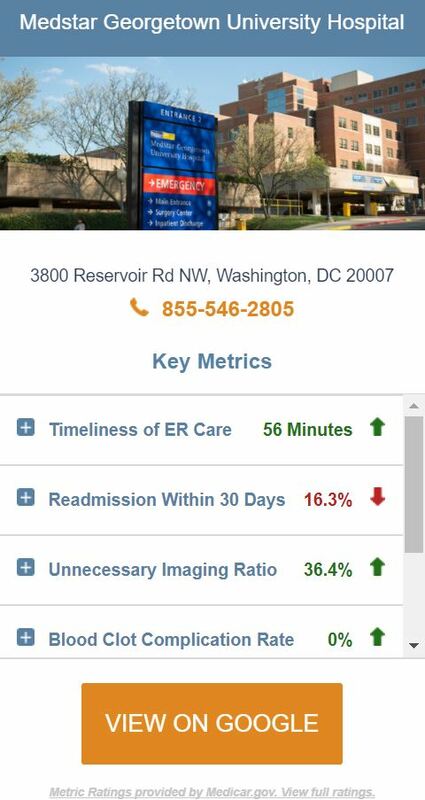 Readmissions within 30 days. This is the so-called “bounce back” number. Hospitals that have a high rate of readmissions within a month may be sending patients home too soon. Unnecessary imaging ratio: This tells the percentage of patients who get MRI’s for lower back pain before they’ve tried various treatments. Doing an MRI first is generally thought to be a waste of money. Blood clot complication rate: Blood clots which form in the legs in immobile patients can become deadly if they travel to the lungs and cause a pulmonary embolism. There are a bunch of strategies to prevent these clots, so hospitals with high rates of blood clots are generally thought to be falling down on important preventive care. Scheduled early baby delivery: Most of the time, babies do better on their own delivery schedules. Hospitals with high rates of scheduled early deliveries are thought to be overly aggressive with Mother Nature’s plans and may be putting babies at risk for health problems. Patient satisfaction rating: This is a score from 1 to 5 that represents an average of consumer ratings. The numbers all come from the federal agency Medicare that gathers these and other measures for quality and safety. 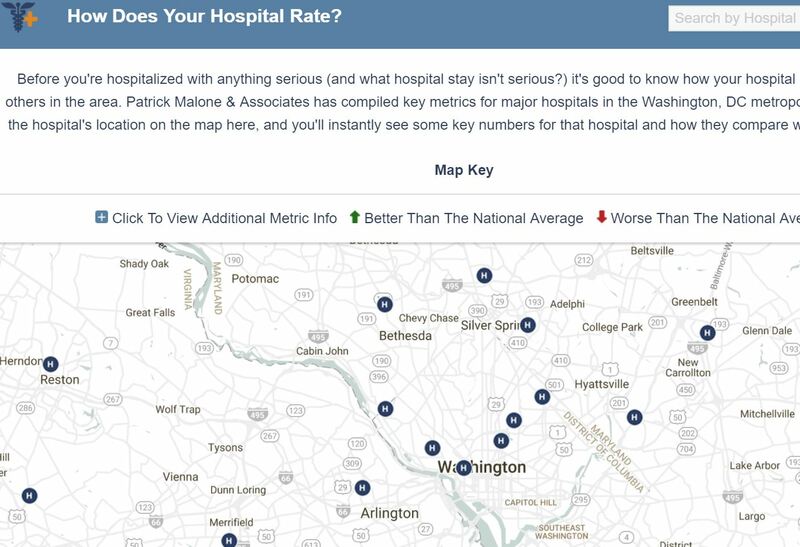 Check out Medicare’s Hospital Compare website for more information on DC hospitals and nationwide.